A SpaceX Falcon 9 rocket carrying an unmanned Dragon cargo ship bound for the International Space Station stands atop a launch pad at Florida's Cape Canaveral Air Force Station early on Saturday, Sept. 20, 2014 in this NASA image. Bad weather forced SpaceX to postpone the planned Saturday Dragon launch for at least 24 hours. CAPE CANAVERAL, Fla. — A commercial SpaceX Dragon supply ship packed with NASA experiments — including 20 mice destined for the final frontier — will have wait at least one more day to blast into space after bad weather thwarted a launch attempt early Saturday (Sept. 20). A drizzling pre-dawn rain and thick clouds lingered over SpaceX's Florida launch pad here, forcing the company to postpone its Dragon delivery mission to the International Space Station for NASA until Sunday (Sept. 21). 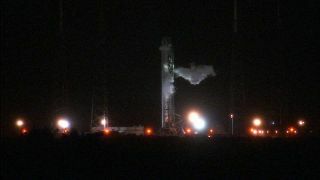 The SpaceX-built Falcon 9 rocket carrying the Dragon capsule is now set to launch at 1:52 a.m. EDT (0552 GMT) on Sunday. "We have scrubbed today's launch opportunity because of inclement weather," NASA spokesman Mike Curie said during the countdown commentary about a half hour before the targeted 2:14 a.m. EDT (0614 GMT) launch time on Saturday. "We're hoping the weather will be more favorable," Curie said. Visit Space.com early Sunday for complete coverage of SpaceX's latest Dragon launch for NASA. To follow the countdown with live updates, visit our partner Spaceflight Now's Mission Status Center. Editor's note: This story was updated to correct the launch weather forecast from NASA, which calls for a 40-percent chance of good launch weather on Sunday for SpaceX's Dragon mission.